I do not know the name of next xperia flagship and this is why "Xperia 2" could be the one. So whoever leaked about "Xperia 2" had no idea about next flagship and device name must be just guess although it might end up with lucky one. What's wrong with wireless charging? and why did they drop the DVS? Maybe because DVS is most retarded thing ever included into the smartphone? People want to charge their phones as fast as possible with all safety. Qi is much slower. Sony phones support 18W charging. Not even counting the facts temperature rises more and not that good for battery health. I do not know if 1 lacks the DVS. I hate the vibration of PS control. Who said they dropped DVS? Yes that is very useless but Zack said 1 has it. It does seem a bit backward of them to allow competing OEMs to take advantage of their own tech before they do so themselves. Mind you, we haven't yet seen what the finalised X1 is capable of, have we? Sony Semicon has autonomy to sign deal with OEMs to make what kind of sensors they want to buy. Huawei, Apple and Samsung have deal and get exclusive sensors every year for their main phones. The imx600 (P20 Pro) , imx586 and the sensor of P30 Pro do not have DRAM. Without it few stuff are not possible. Quad Bayer unless you change settings will give you the amount of details of the lowest resolution. 40 binned to 10 is same thing of a bigger 10MP sensor. It is very different from the DOWNSAMPLING used before X series. So huawei uses 4 freaking Sony sensors, some of which are custom made, while Xperia has 2 from Samsung and the main one is basically the same as the one they produce for Samsung. I hope this is really temporary. Once Sony said it themselves how multiple cameras were going to be the trend and kept only one camera for too long now all other major brands have tof sensors while we have no idea when they'll adapt one even for the front. First they don't want to cannibalize their camera sales, now they don't want to give their own phones better sensors because there are bigger companies with bigger pockets to sell to. Is that 26th April date for announcement? Some say release, which I doubt. Even for Taiwan. Keep in mind it might not be too far into the future that we could see a Light-based camera design used on an Xperia. The exmor of X1 is not the same used for Snapdragon version of S10 lineup. One is 1/2.5" while Sony is using 1/2.6". Samsung sensors are exclusive since S6. Probably the UWA and tele are the same ( no exmor is 1/3.4" 12MP), since iphones use too for tele same of Samsung. Selfie seems to be isocell too, because on products page only main is told to be exmor. I guess the smaller main cam must be to make sure all there modules are exactly same thickness. Reason all phones use smaller for tele. 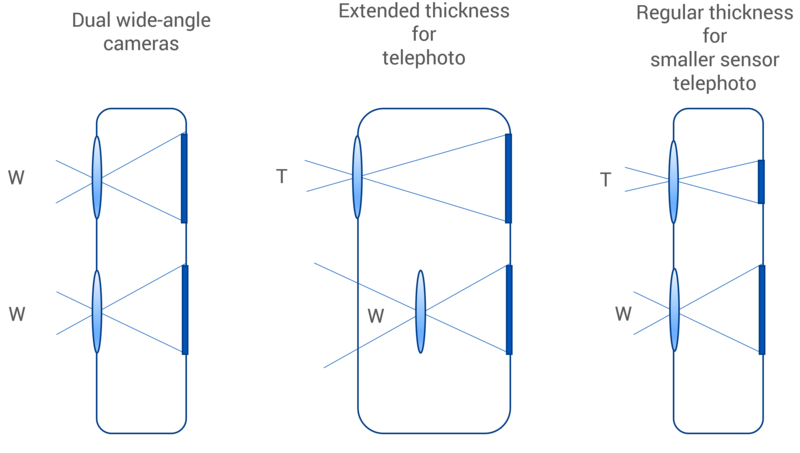 If both had same sized sensor, tele would have twice the thickness of the wide. Well, that's just your opinion. I like it.